A true, one-handed travel system. Dont struggle to carry your baby in the infant car seat. The GoGo BabyZ Infant Cruizer AT is so maneuverable and convenient you can take it anywhere - restaurants, the drug store, doctors office, taxis, trains and more. 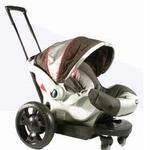 The Infant Cruizer grows with your child. The Go-Go Babyz Infant Cruizer is the newest travel system on the market which provides a convenient and comfortable way to transport your baby without taking him or her out of the infant cart seat. The Infant Cruizer is a fantastically convenient accessory for parents who travel with small children, frequently or otherwise. Its compact design, easy push, and car seat compatibility reduce the need for a stroller on short or long-distance voyages. The Infant Cruizers fold up design and telescoping handle save a TON of space over full size strollers. Each adaptor for infant car seats allows you to snap the carrier into the Infant Cruizer just as you would the car seat base.